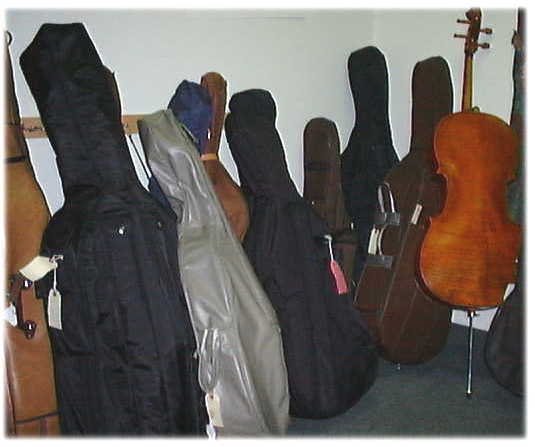 We have Cellos (also known as Violoncellos) and Basses (also known as String bass), Double bass, Upright bass, Standup bass, Acoustic bass, Bass violin, or Bass fiddles) made by Italian, German, English, French, Czech, Canadian and Chinese craftsmen are available here regularly. Please inquire if you have a specific request for a fine old master instrument. Listed below are some of the fine Cellos and Basses we currently have in stock. NOTE: Some of our finest instruments are not listed on this site. Please inquire about specific requests. All consignments will be considered. Trade-ins are also welcome. We usually give two-thirds (or sometimes more) of the original price back on trade-in instruments and bows purchased here if they are in the same condition as when we sold them, barring normal usage. If you have an instrument or bow that was not originally sold to you by us, we will also be happy to consider it for trade-in. All prices are in Canadian Dollars unless otherwise noted. #4/4-2344 SOLD August Kristall of Estonia, made in 1911. A well-made professional European cello bearing the brand of and made by August Kristall dated 1911 on the upper back below the button. Well-restored condition. Very fine big sound and response. This maker opened his shop in Jurgenthal in 1889 and later moved to Tallin where he was still making instruments in 1929. #4/4-2741 This is fine copy of a cello made by Joseph Guarnerius filius Andreas in the early 1700's. Serial #108298. Beautiful, fully carved spruce and maple selected for prominant sound with full tone that projects well. Bela von Kabay Shop, Made in Hungary, c1974"
#4/4-2305 Made by the master makers in the Gliga shop in Reghin, Romania. Excellent wood and workmanship. Easy and quick response with a big tone. Comes with certificate of Authenticity with photos, signed by the maker. Made in Beijing SOLD A very fine-sounding and beautiful copy of Yo Yo Ma's "Davidoff Stradivari" cello. Giovani Basino, 2001, Beijing. #4/4-433 SOLD Master level cello, an "Antonio Stradivari 1712 model." It is made of top level spruce and maple tone-woods, by professional luthiers trained in the Italian Cremonese style of cello making, to develop a powerful, resonant tone. and maple. Excellent workmanship. Fine resonant sound with good projection. Andreas EASTMAN cello model 605 Superior sound with pleasing complexity. Very responsive with power when needed. Hand-carved of very fine select spruce and well-flamed maple. Attractively shaded varnish -- from dark orange-brown to lighter yellow-brown in some places in the manner of an older instrument. Montagnana or Stradivari models. 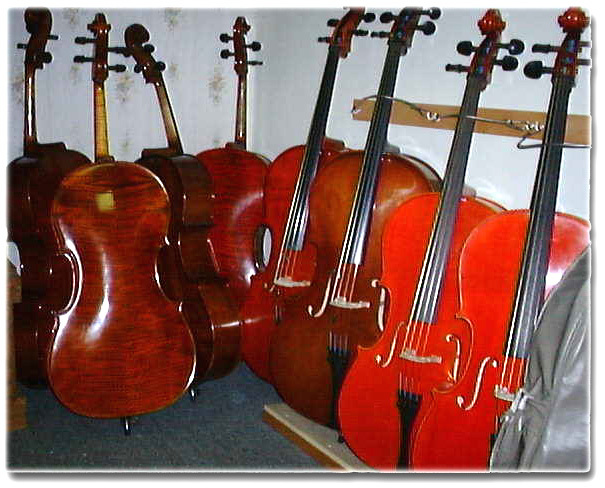 with professional strings as most of our cellos are. SOLD Made of real spruce and maple, this is a good beginning cello outfit, including a cello bow and black bag. #4/4-2627 A fully-laminated (spruce and maple) cello with about 95% varnish intact. Also labelled "Salvadore de Durro, B&J NY. Has good Jargar strings. Nice hand-carved cello with full, responsive sound. High grade strings. All ebony fittings with Wittner tailpiece with built-in fine tuners. Warm golden-brown. #13/13 Laminated spruce top, maple back and sides. Ebony fittings. 3/4 Karl Knilling cello outfit. Cello chair by "Adjustrite USA." PHOTO SOLD Cello chair by "Adjustrite USA." FULLY adjustable in height folding cello. - player chair. Set at medium notch of 7 settings in the picture. The chair that matches your exact height at ages 6 - adult. Note: 3/4 size is the standard size for Basses. We sometimes have 5/8, 7/8 and 4/4 size basses too. Please check by email. #3/4 - 2806 Elite model 6 A Vincenzo Panormo of England Elite model bass. Excellent fully-carved spruce and curly maple specially selected tone wood. The Elite model is made only by the their master makers. #3/4 - 2805 Elite model 5 A Tomasso Carcassi of Italy Elite model bass. Very fine fully-carved spruce and curly maple. The Elite model is made only by the their master makers. Various models and sizes. 3/4 size or 7/8 size. All carved spruce top and carved maple back, sides neck and scroll. Attractive brown varnish. c.2006. #CCB517 SOLD Laminated bass. 3/4 size standard upright string bass. Excellent condition. German laminated large 3/4 bass c.1960 SOLD Very fine playing condition. Naturally worn original varnish. Chinese "ETUDE" SOLD 3/4 size basses. Solid carved spruce tops. Nice finish. Laminated maple back and sides.